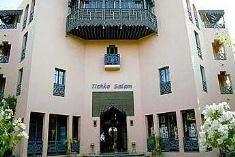 Tichka Salam Hotel Marrakech, Hotel Morocco. Limited Time Offer! This Marrakech hotelRead more is of a Luxury category and is a four star . You will find several amenities such as : n.a..It is situated at route de casablanca marrakech-morocco in the west section of Marrakech, at only 15 minutes walking distance from the center.You can reach Menara in 8 minutes by car (the airport is 2 miles from the hotel).